The Ascension War sputtered to an end, thanks to human apathy. The Council of Nine Traditions now sits on a cusp, as certain mages try once more to re-ignite hope in themselves and others - not just hope, but a striving for something, anything. Others want things to stay the same, to maintain the current, feeble status quo. This conflict threatens to destroy all truces - not just the cease-fire between the Technocracy and the Traditions, but the long-standing bonds between the Traditions themselves. Nowhere is this simmering conflict more evident than in Las Vegas, city of neon and illusion. 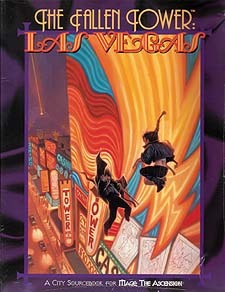 Like the Tarot card that symbolizes the city, Las Vegas' mages flirt with the Devil but yearn for the Star. In the lavish casinos, on the decadent Strip, and in the silent deserts, mages gamble their souls for a piece of the dream.